Have you ever wondered how scientists are able to look at cells under a microscope? One way is to use a special machine called a cryostat, which cuts pieces of brain or muscle into super-thin slices. (Jake recently wrote a post about another way to study cells, here.) If you’ve ever watched someone use a deli slicer, you already know how a cryostat works! As I turn a wheel with one hand, the machine pushes the tissue sample closer to a small blade, and the blade very precisely slices through the tissue. What makes the cryostat special is that it works at really cold temperatures (0⁰ F, the same temperature as the inside of your freezer! ), and it cuts frozen tissues into little pieces that we call sections. Each section of a tissue is so thin that, if you stacked five of them, they would be as thick as a strand of human hair! After we cut each section we put it on a microscope slide, and then we can look at the lizard’s cells under a microscope. We have to work very carefully, and sometimes it can take over an hour to cut through a single lizard’s brain! 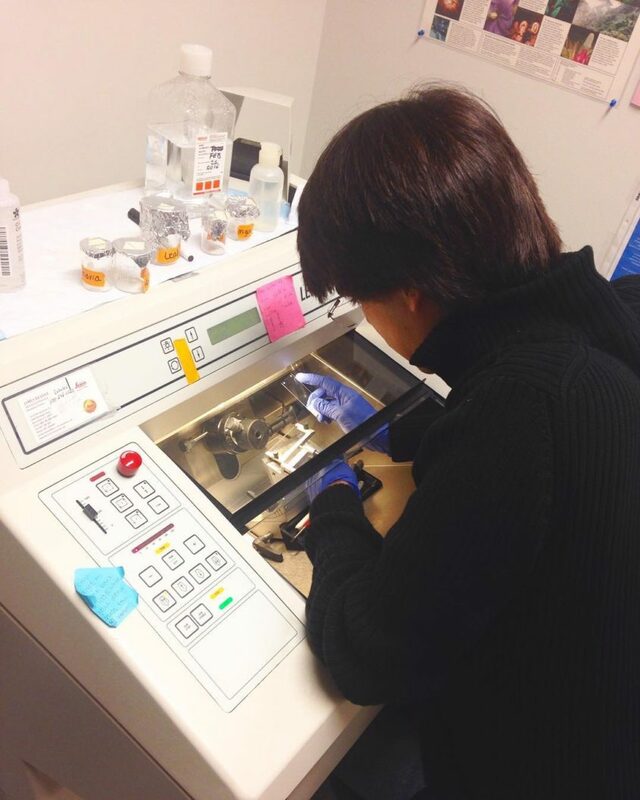 Using the cryostat takes up a big chunk of my time, and I like to listen to music while I work. This keeps me happy and energized. Although using the cryostat is sometimes hard and it takes a lot of time to use it carefully, it is an important part of my research. I am looking forward to looking at brain cells under the microscope soon!